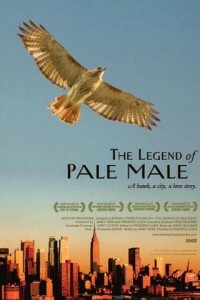 The movie “The Legend Of Pale Male” is the true account of one of the most surprising and remarkable love stories in the history of New York. It begins in 1993, when a young man from Belgium looking to change his life has an unexpected encounter in Central Park. He meets a hawk. Not just any hawk, but a wild Redtail, a fierce predator that has not lived in the City for almost a hundred years. Compelled to follow this extraordinary creature, he buys a video camera and sets out to track the hawk. Little does he know that the journey will take him almost twenty years and lead him down many trails of life, death, birth, hope, and redemption. Affectionately known to New Yorkers as Pale Male, the hawk becomes a magnificent obsession and a metaphor for triumph against all odds. His nest, perched on a posh 5th Avenue co-op, starts out as a novel curiosity to a handful of avid birdwatchers but becomes an international tourist destination – a place of pilgrimage. Then, on a December afternoon without warning, in the space of half an hour, the building dismantles Pale Male’s beloved nest. In a wingbeat, media from around the world assemble on 5th Avenue to cover the unprecedented protest. Gathering behind Pale Male is an army of birdwatchers, movie stars, poets, children, dogs, and late night comedy show hosts. What unfolds next, as they say, could only happen in New York.